Karuba is a solidly crafted 2-4 player Euro board game for ages eight and up, with playtime clocking in at 40 minutes or so. Publisher HABA has squarely focused it on the family market, getting it 100% right with an engaging theme, simple mechanics and easy-to-pick-up gameplay. Whilst potentially still short and sweet enough for more ‘grown up gamers,’ Karuba is more perfectly formed and paced for groups with younger players; no surprise then that this game was a Speil des Jahres nominee in 2016. As a tile laying game, initial comparisons with Carcasonne are front-of-mind — but this is no area control jaunt, rather more a case of ‘route and race’. 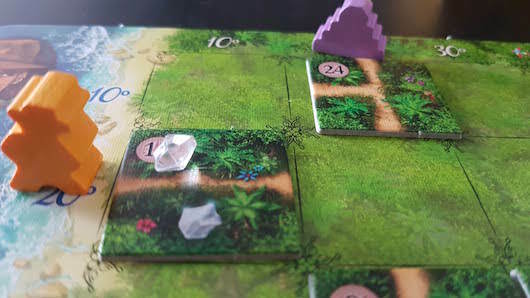 Players simultaneously lay tiles to complete paths through the jungle, enabling the swiftest to claim the juiciest bounties from the final temple destinations, or alternatively collect enough scattered bounty from the jungle paths instead. Who knows where the most reward can be found… (and therefore who the final winner might be)? To begin, all players start with their own copy of the same, identical game layout, collectively choosing four expedition start-points (on the beach), and four corresponding destinations (treasure temples). This is worth bearing in mind when setting up, as the game can look a little overbearing and feel time consuming at first, given the amount of components. However it plays fairly effortlessly once underway. Each turn the expedition ‘leader’ (a functional title having no impact on play) then draws a random tile – containing paths, entrances and exits (and sometimes treasure) – which the other players also then select and play. And right there, that’s the beauty of the game. As all players have the same tile to play each turn, it’s what you do with the tile that counts. Choosing when to lay a tile or discard it (to move a team forwards)— and what paths you create through the jungle— all make for a more fiendishly clever puzzle than is at first apparent. “But Joe,” you say, “doesn’t having an individual game board create a fairly isolated game experience?”. And whilst yes it’s true, there is no direct interaction between players’ boards; the truly canny will keeps a constant eye out for who is racing to what temple treasure, where, and adapt accordingly. And it’s also worth mentioning that although tiles are drawn randomly, I do wonder about the longer-term replayability of the path-tile puzzle mechanic. After a few playthroughs, the optimal tile laying strategies soon become familiar. 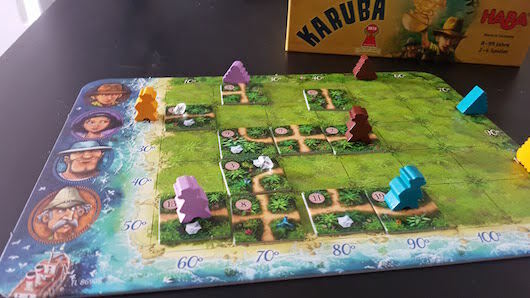 And lastly, like many games that where it is the difference between player strategies that drive the game, Karuba with two doesn’t quite hit the same sweet spot as with three or four. So that said, is it really “fun for all the family” then?”. Yes, I think so. Components are bright, engaging and well-made, with some nice touches of sparkly gem treasures thrown in for extra appeal (although the card-stock temple treasures feel a little underwhelming in comparison). Overall I’d have no problem recommending this game for casual players; those wanting something inclusive for younger players; or those simply wanting a short-to-medium-ish bite of good solid gaming goodness, without anything too adventurous. However, for those times when you need something a little more enticing, there are (newer) alternatives for those wanting a bit more weight, flavour or puzzle for their pound (especially as I think about it, for games using a ‘personal board’ like this one). So that’s it, decision made, I’ll hang on to my expedition shoes for the odd once in a while jaunt, but will trade in the bullwhip and hat for a Portuguese tile-laying time-share in sunny Azul. Great review. I agree with the setup and first few turns not feeling as fun as the rest of the game. Cheers Jesta. Floppy hat an obligatory accessory!